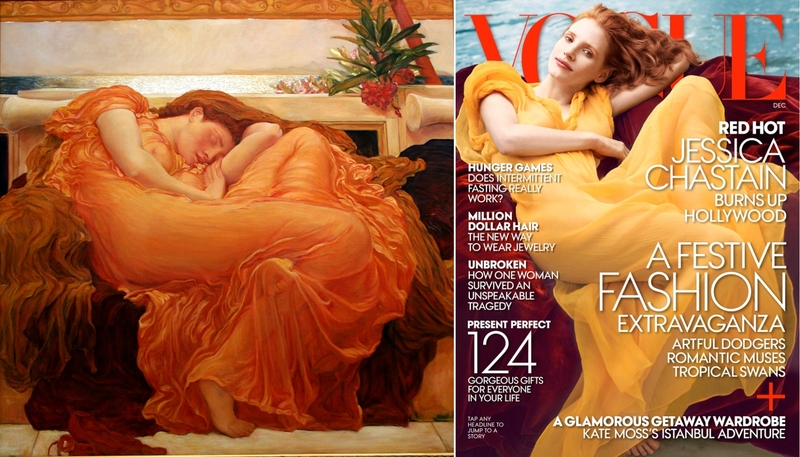 I love pre-Raphaelite women and I love homage, parody, covers, remix, mashup, etc., so I’m crazy for Annie Leibovitz’s photograph of Jennifer Chastain as Frederic Leighton’s Flaming June (1895) for the cover of the December 2013 Vogue. The Vogue website has a slideshow counterpoising the photo shoot with the inspirational source material. This isn’t the first time I’ve posted about Annie Leibovitz and Vogue spoofing some vintage design. Perhaps the most popular post on this blog (not because anyone is interested in the rambling post; mostly because people are ripping off the image) is “Destroy This Mad Brute“, an analysis of the meaning of LeBron James and Gisele Bündchen mimicking an anti-old Europe First World War U.S. propaganda poster.